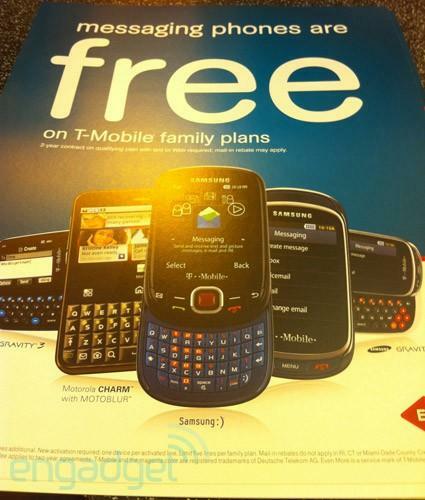 You are here: Home > Motorola Charm To Go Free On Family Plans? Motorola Charm To Go Free On Family Plans? Update: We’ve just received word that from July 31st- Sept 7 the Samsung Gravity 3, Gravity T and Smile along with the Motorola Charm will be free on the family plan promo, as the poster shows. According to this image obtained by Engadget, the Motorola Charm, which should be arriving sometime in the next 45 days or so, will be going for free on qualifying family plans and with a 2-year contract. Of course, we’ve also heard that the Charm will be going free during a back to school promotion T-Mobile should be running later this summer. So it looks like one way or another, the Charm, whenever it arrives should be priced about right for the first Qwerty offering from T-Mobile and Motorola. Now, what about these battery issues? Personally irked by the crappy screen resolution even going one down on the G1’s… but otherwise it seems like a nifty Android device for someone just starting off with a feature full phone who don’t have the pockets for a higher end device like the Vibrant or the HTC stuff rumored to come down the pipeline. If this thing is priced like a typical dumbphone then it’s pretty much a winner in my book. Also curious as to how a Cliq and OG MT3G is priced @ this point. I have the Samsung Vibrant and this thing is exactly what all the hype was about! Anyone that is or was planning on getting this Should definitely get this phone! It’s everything all of you people wa nted and more! The DLNA support on this phone is AWESOME!! And the screen is AMAZING! fyi it is not the 1st qwerty from t-mobile and motorola.. It is the first Android qwerty. How is this the first QWERTY offering when the Cliq has been out for some time now? I think he means in a BlackBerry form. Does anyone know if this promotion will apply for upgrading lines on a family plan, or is it just for new lines? i get the feeling this is phone first data. the reason I say that is this phone is lumped in all the time with feature phones. they are not marketing this thing as a smart phone. if tmo does this, and that’s a big if, I am all over it! There are loopholes. for example nexus 1 does operate on phone first. my understanding is that they just need to set whatever settings they want up in their system. it just seems curious that this phone is being marketed as a messaging phone along with there other phone first data plan phones. My Nokia E73 works fine with the grandfathered web2go eventhough some in here have said it may require a full data plan. I’m saying the socs that I ad for a living as a tier 2 tech do not work. There are certain data socs for certain groups of phones. We don’t support it in house. Yes there are apn and VPN hacks but we don’t support it so we won’t offer it. I can add any data pack to any phone in the iHLR but it won’t stick with out the proper soc in sampson. Unless tmo has a new phone first android soc coming down the pipe line, it’s just what I said. $30 bucks a month! And an android soc that’s only $10 a month makes no since. The phone is 3g and android is very data rich and hungry. I hope it doesn’t happen or it’s just more money we loose on the back end and our sales reps will have less reason to sell the phone. The Motorola Charm will require the Android web ($30/month).